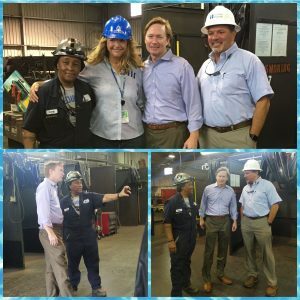 Adam Putnam, Republican candidate for Governor and Florida’s Commissioner of Agriculture, visited our facility on Friday, July 20th for a tour of the A.W. Hendry Training Center and to meet with Gail “Candy” Jones, Quality Assurance Manager and Welding Instructor. 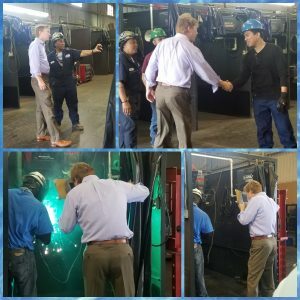 The job-specific vocational training programs offered by our Training Center align directly with candidate Putnam’s commitment to the development of Florida’s technical workforce, as stated in his Florida First Jobs Agenda. We were very excited to welcome Commissioner Putnam and staff to our facility to showcase a working example of a successful model for industry-specific technical training. Many thanks and kudos go out to Candy Jones and her staff for creating and running the Training Center program, a living example of Hendry’s commitment to workforce development within the maritime industry.